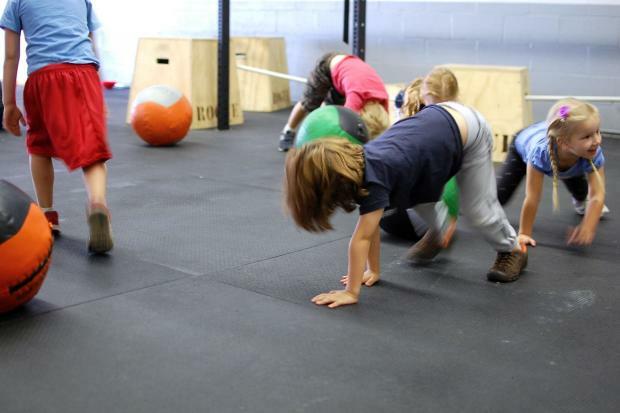 LONG ISLAND CITY — The CrossFit workout craze is about to get some new pint-sized devotees. The Hunters Point gym CrossFit Gantry will begin offering classes to children as young as 3 years old this week, giving kids a specially tailored version of the popular fitness program — which emphasizes strength, conditioning and a varied workout routine. "They love it," said Michele Kelber, a certified CrossFit Kids coach who says youngsters are often drawn to CrossFit because they want to work out the same way as mom or dad. "A lot of times, we have adult members bring their kids, and the kids are just dying to do it because they see their parents do it," she said. In other cases, the parents watching their kids exercise decide to join. "And sometimes it’s the other way around — sometimes parents end up joining who would never have seen themselves doing CrossFit," she added. The price tag might be a heavy lift for parents, with a kids membership costing $140 a month for class once a week, or $280 a month for classes twice a week. Classes will be offered on Thursdays and Saturdays. Kelber says the popularity of CrossFit gyms is now starting to spill over to the younger set: she currently runs another kids program in Williamsburg, and will be starting one soon in Red Hook and another next month in Astoria. "It's gone very mainstream, and I think in turn, people are starting to develop kids programs," she said. Unlike the adult version of the workouts, Gantry Kids won't be expected to lift a kettlebell above their heads. The classes will teach them the traditional CrossFit movements, like squats and overhead presses, but without weights, Kelber said. The weights aren't necessary or healthy for young kids' overall fitness, since their quickly growing bodies have enough to cope with, she said. "Children develop and grow stronger by doing no weight and lots of repetition," she said. "They don't do anything with a barbell." The classes will incorporate colors, counting and add an element of imagination to movement. Kids will practice their best bear crawl or crab walk, build castles out of fitness mats and move them together as a team, or do a squat while pretending to be an angry gorilla. "For them, it's just like a huge game," Kelber said. CrossFit Kids will also emphasize functionality in movement, teaching children exercises that apply to their everyday life, like how to lift a heavy backpack without injuring themselves. But Kelber says CrossFit can benefit kids in a number of other, less physical ways, instilling in them a love of fitness and giving them a self-esteem boost and sense of accomplishment as they improve over time. "There's community and there's team building, but it's also individual," she said. "They can see the measurable results for themselves — that was hard before, and now it's easier — and it doesn’t rely on them having to outrun somebody else on the soccer field." CrossFit Gantry, located at 10-20 47th Road, is offering a class for kids age 3-5, another for ages 6-12 and a third class geared for teens. Those interested in learning more or signing up can email Michele Kelber at kids@crossfitgantry.com.